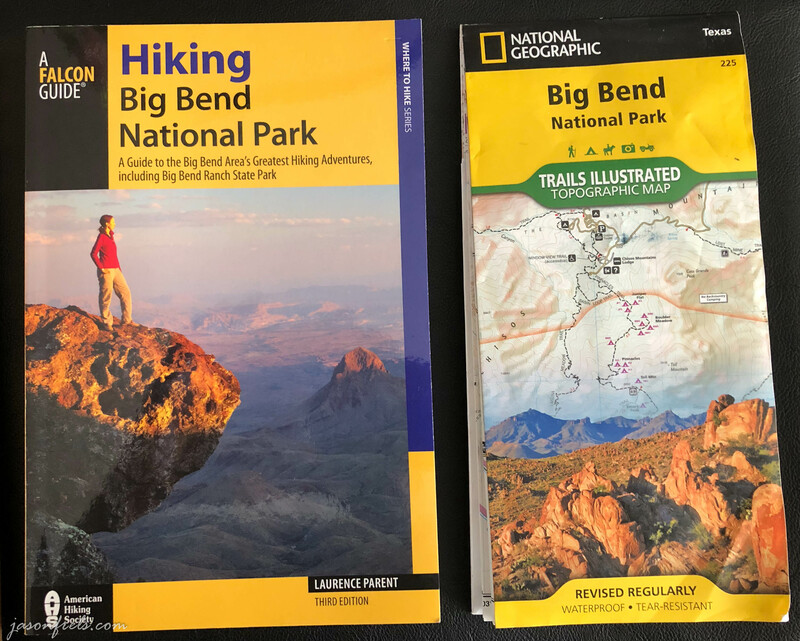 I have lived in Texas most of my life and have never been to one of the most beautiful landscapes in the state – Big Bend National Park. I have been around the area a few times, but never made it into the park. The main reason for this is the remoteness of the park. The park is located on the big bend in the Rio Grande river that forms part of the border between the USA and Mexico. It takes me 8 hours of driving to get to the park and it is not located near any cities. It is also part of a desert and I doubt that it is much fun to visit during the summer, which is why I planned a trip for December. 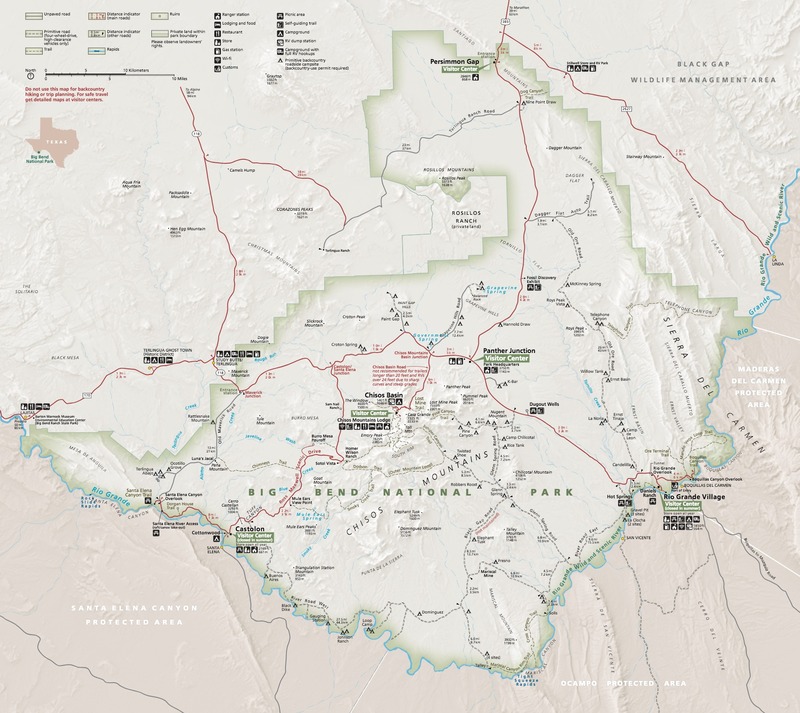 The image below is the map of Big Bend National Park. In the center of the park is Chisos Basin campground, where I planned my first two nights camping with a reserved tent camping place. From Chisos Basin there are many hiking trails including a trail leading up to the south rim of a mountain range that basically overlooks the South half of the park. My last night of camping was reserved for Rio Grande Village down close to the river. Just driving into the park it is so picturesque, that it is hard to get far without wanting to pull over and take a photo. 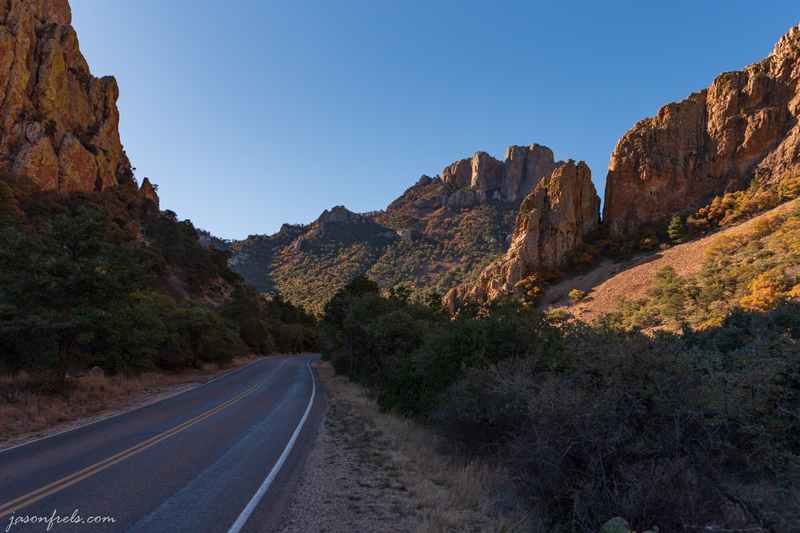 Below is a picture from the side of the road leading up to the pass to Chisos Basin. The park nicely placed several places on either side of the road for people to pull over and park to take photos. I arrived at my campsite in the late afternoon and set up my tent and walked around a bit planning out my next few days. Amazingly enough, there was good cellular service in this camping area, so I didn’t have to be out of contact with family much. The weather called for low temperatures just above freezing and fair weather, but it got cold and rainy the second night. 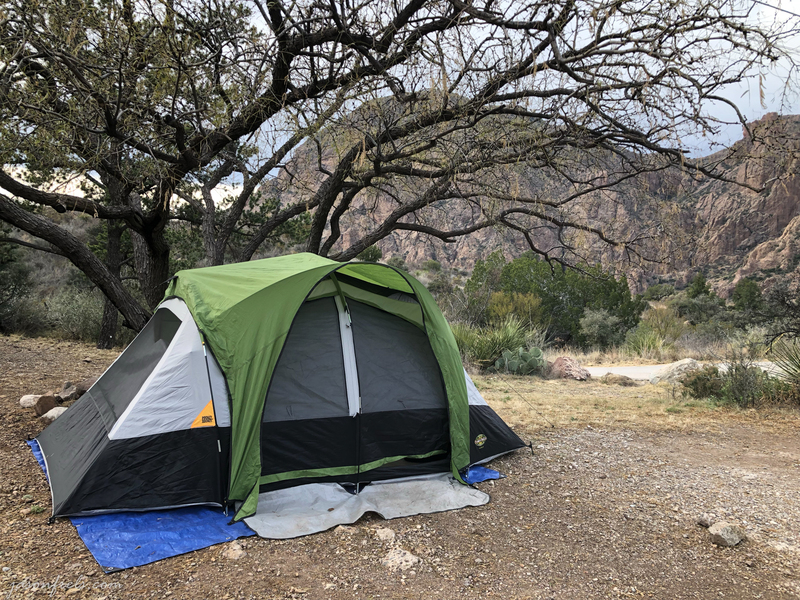 The below image shows my tent in the Chisos Basin campground. I ordered a large map of the park and a hiking trail guide book before my trip to help plan my hikes. Both of these items were of great use. The map had much more detailed maps of the trails than the map they give you at the visitor’s center and the book provided a lot of additional information about each hike. I ordered this stuff from Amazon and it didn’t cost much, so I would recommend this to anyone planning a hiking adventure in a National Park. 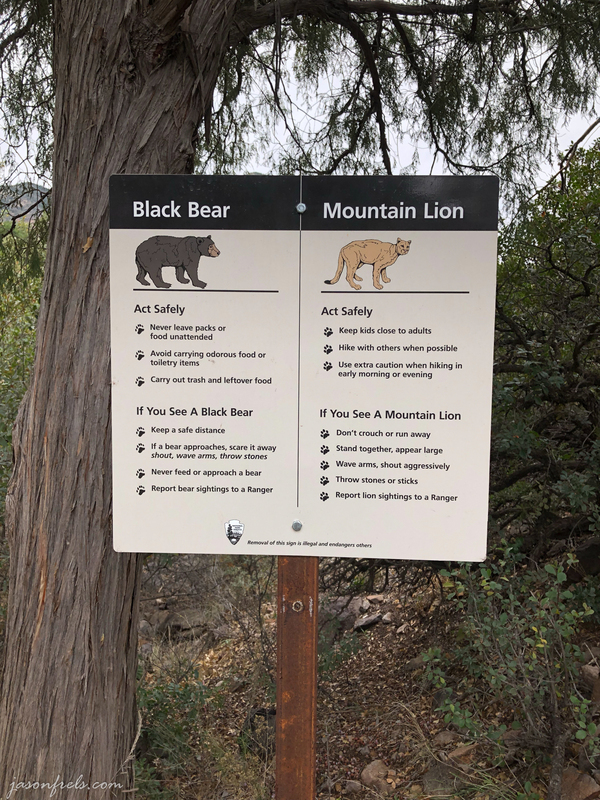 There were signs posted everywhere about mountain lions, black bears, and javelinas. There were also bear proof storage bins for food at every campsite. I didn’t see a bear or mountain lion, but I saw a javelina by the road. I kept my food in the car and didn’t have any trouble. As it got dark, there was a sliver of moon in the sky and the clouds broke revealing part of the sky. I tried to take a few pictures of the stars over the mountains by the small amount of moonlight. 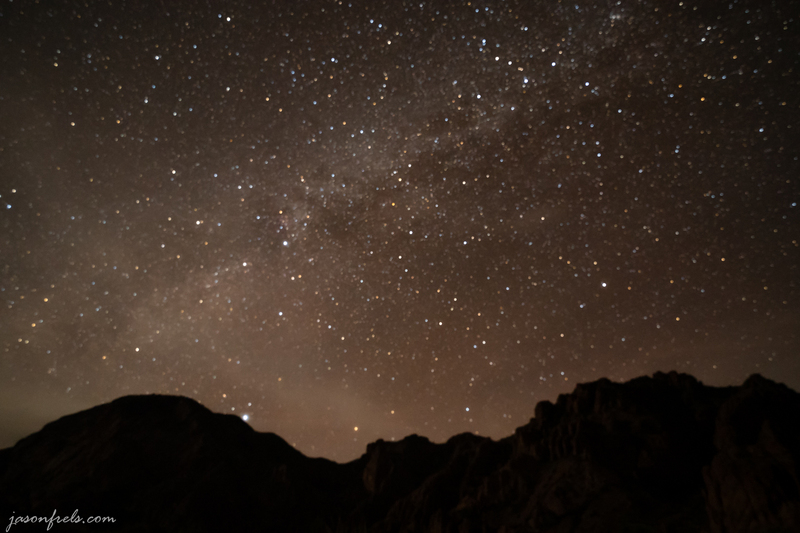 My slightly out-of-focus picture below showing part of the Milky Way in the western sky above the mountains. The next day, I started hiking and enjoying the park. More on that in the next blog. I love Big Bend! It’s been a few years since I’ve been; maybe during spring break this year. It’s tough being so far away, but if it wasn’t far away, it probably wouldn’t be so great. Those pictures are amazing. I will need to plan a trip to Big Bend. There are some really good and strenuous hikes out there. I did a 13.8 mile, 7:40 hour hike up from the basin to the south rim and back. That was a work out. I wouldn’t do it during the summer; that would be punishment. Glad I dont have to contend with mountain lions & black bears out on my hikes! Looks like a great place to explore…and not a bad view from your tent either.